Stanbic Bank Tanzania (SBT) held a Chinese Economic forum in Dar es Salaam on Tuesday 16th March 2017 to assist the Chinese business community wanting to invest in Tanzania. According to the bank’s Executive Head of Corporate and Investment Mr. Thomas Bisonga, the China direct investment will be driven by Stanbic Bank Tanzania’s aspiration of, supporting the growth of economic activity in Africa. The forum was organized to demonstrate the bank’s commitment to partner with Chinese customers in their quest to move their business to the next level. 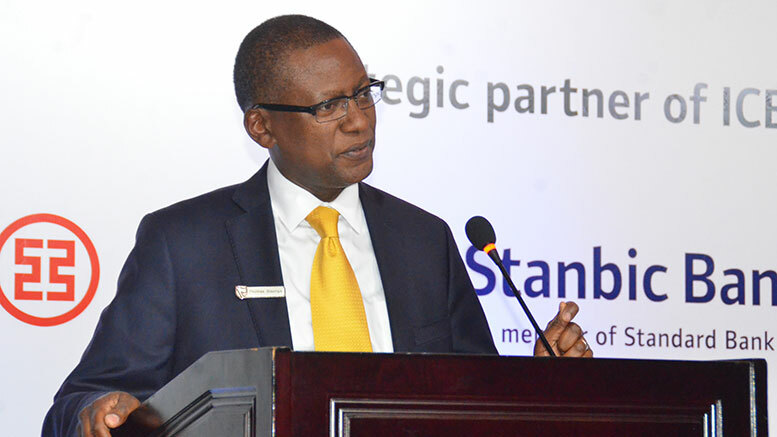 Through the partnership, Stanbic Bank is able to link its clients to growth opportunities offered by Tanzania, and other African economies, Bisonga explained. Stanbic established a China desk with Mandarin speaking staff to facilitates free flow of business between the two countries. “We established the China Dedicated Desk to help facilitate international trade, infrastructure projects and investments between Tanzania and China,” Bisonga said, adding that the service makes Stanbic better placed to meet the needs of all Tanzanians and Chinese seeking to do business in the region. “The launch of our China Desk creates a hub in Tanzania to help our clients in Tanzania take advantage of the growth opportunities in one of the continent’s most promising economies”, Bisonga added. Bisonga noted that since inception of the Desk, hundreds of companies from China and Tanzania have enlisted with the bank, reminding that Stanbic has systematically rolled out similar services in its other branches on the continent. Speaking at the same forum, Jibran Qureishi the bank’s Economist for East Africa appealed to the government to foster a conducive business environment that will make Tanzania a viable investment destination. “This can be achieved by prioritizing the various public sector reforms to ensure fiscal prudence in the management of financial resources,’ said Qureishi. Qureshi underscored the urgent need to continue investing in infrastructure development, especially the utilities sector that includes power, water and sanitation systems. He elaborated that major infrastructure projects could be undertaken through Public Private Partnerships (PPPs) whereby the government would facilitate the process while private investors provide the capital requirements. He also reminded that the bank leverages on its extensive geographical footprint in 20 African countries, which provides the ideal gateway to promote cross-border investments between Africa and China. The bank provides the full spectrum of financial services to public and private sector corporations, diplomatic missions and international organizations. Stanbic offers a wide range of services to Chinese and other businesses in Tanzania – Bid Bonds, guarantees, foreign exchange and debt, throughout Stanbic Bank’s physical and electronic channels.